When the recent cloud of volcanic ash cruelly snatched my vacation away from me, not only was I miffed I wouldn’t be heading across the ocean (and let me tell you, there’s nothing more depressing than unpacking a non-used swimsuit, sandals, and sunscreen out of a suitcase), but I was sad I would be missing dinner with Yotam Ottolenghi at his restaurant, Ottolenghi. I’d written him a fan letter, and after agreeing to a psychiatric evaluation, and a pass through a metal detector, he consented to have dinner with me. I swooned over his first book and featured his gently salted, crisp almond chocolate-dipped Florentines a while back, which I had trouble not finishing the moment the slick chocolate coating had cooled on their underside. Usually when flipping through a new cookbook, I bookmark a few things that catch my eye. Like his previous book, if I’d bookmarked all the recipes I wanted to try in his new book Plenty, my copy of the book would’ve been twice as large as it originally was. This book has no desserts, which I will forgive him for, but is filled with vegetarian recipes, which is natural since his food relies heavily on abundant use of fresh herbs, ruggedly roasted vegetables, and lots of exciting seasonings. Although it’s a bit of a cliché, it’s true that you’d never miss the meat in any of these recipes. Because many rely on caramelizing in a pan, oven-roasting, and using a generous hand with sometimes exotic spices for their satisying flavors. 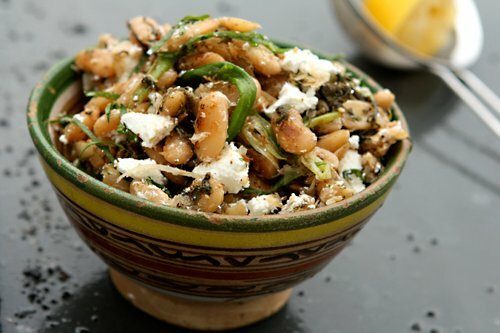 But his recipe for Fried Beans with Sorrel, Feta and Sumac recipe stuck out to me as it prompted memories of my mother, who roasted lima beans in melted beef fat, which made them extra-crispy on the outside and soft on the inside, like little oval frites. Although they were far better than any fries I’d ever had. Come to think of it, perhaps I’ll head back to the butcher and try my luck again at getting some beef fat and give them another go. Neither butter nor olive oil will give you that same bean-hardening (and artery-hardening) effect, but I plucked out the crispest beans from the bowl and ate them before tossing them in the wilted sorrel and spring onions. And I was surprised at how delicious they were. In addition to still not having learned to use a large enough pot for boiling beans, I’d also never thought of pan-frying beans, which is a technique that I’m going to remember for the future. I did have to wait a few anxious days before tackling the recipe. 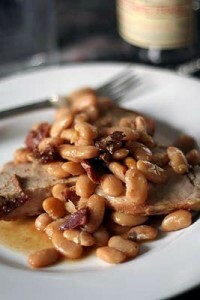 I had everything in my pantry, including haricots Tarbais, the famed white beans from Gascony. (For those in the states, I recommend Rancho Gordo beans.) And sorrel is pretty common in France, so I picked up a leafy bunch at the market. But, of course, I was missing one ingredient: sumac. I know, I know. It’s impossible to imagine anyone not having a sumac in their cabinet. But since it was Sunday afternoon, when hardly anything is open in Paris, I had to wait until the following day. Then I remembered my favorite Arabic épicerie* was open and biked over there quickly, lest anyone else get the same idea I did and get all the sumac before me. Scanning the spice aisles, I found sumac alright. But only in one kilo (2.2 pounds) bags and I thought that was kind of a lot, since the recipe only called for 2 teaspoons. Luckily I’m tenacious and got down on my hands and knees on the dusty floor and dug though all the spices until I found a more reasonably sized bag, and brought it home with a big chunk of feta which I fished out of the brine at the shop. Which was a good thing I remembered, because right then I realized that was another ingredient I didn’t have at home. Sumac adds a quirky, fruity flavor to certain dishes, like Fattoush. Like ground cumin and star anise, it’s one of those flavors that works well when it is just barely present. Too much is overwhelming. But I paid just €1.50 and now have a year’s supply of sumac. One thing you might have trouble finding is sorrel. Sometimes it’s called ‘sour grass’, because when you eat it, it’s hard not to scrunch up your face from the puckery taste. It is worth groveling for because it’s got a rather distinctive lemony taste, and I don’t use often enough. 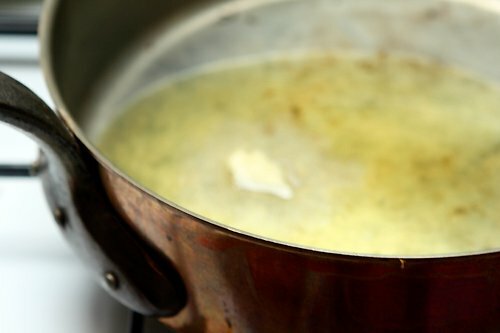 The French will often chop it into sauces, especially ones that are cream-based, to act as a counterpart to the richness of the sauce. You do have to be careful in France, because the word oseille doesn’t just mean sorrel; it also is slang for money. (Similar to in English, where we say “Rolling in dough”.) Which might seem odd, until you see the dark green color, perhaps meant to be reminiscent of American dollars, which we call ‘greenbacks’. I’m not sure how that concept crossed the Atlantic—or why we call money “dough”. (Which I’d like to know if that’s true, because if it is, I have a freezer full of it). But if there is a recipe for money, I’m wasting my time crawling around on my hands and knees, sorting through dusty spice bins while Arabic women give me funny looks. 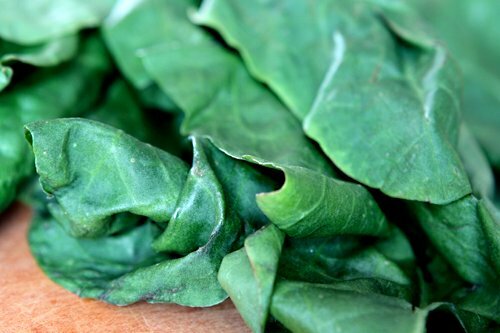 My once-potential friend Yotam gives substitutions for the sorrel: use spinach and double the lemon juice. 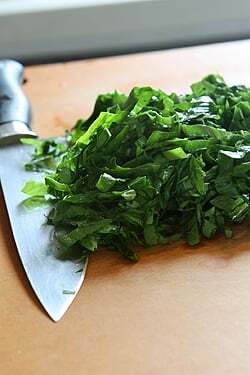 Or I’d venture to say that you could use roquette (arugula) or even mustard greens, I’d imagine. 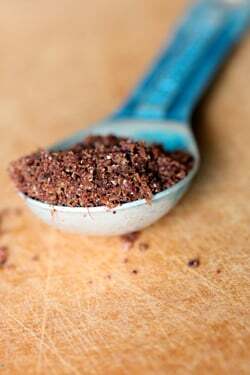 For those of you who can’t get sumac, you might want to try smoked paprika. Although I have plenty left over, and I’m happy to share. But you’re going to have to grovel for it. And perhaps take a mental competency test, too. Adapted from Plenty (Ebury) by Yotam OttolenghiYotam’s original recipe says to soak the beans in a generous amount of water with 2 tablespoons of baking soda. Some bean purists scoff at using baking soda in the water, but for those who live in areas where the water is full of minerals (such as Paris), I add a large pinch to the cooking water, as the locals do. The beans should be cooked just until tender, but not cooked to mush. The cooking time for them will vary but don’t let the water foam up when you do!For the spring onions, I used cébette (which often goes by various names in France), which you can see pictured in the Herbed Ricotta Tart recipe. 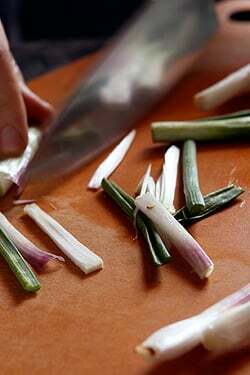 Scallions, green garlic, or a similar spring onion can be used. In the post, I mention some possible substitutions for the sumac and sorrel. 1. Rinse the beans and sort to remove any foreign objects. 2. Put in a large pot, cover with plenty of water, and let stand overnight. 3. The next day, add a pinch of baking soda to the water (if you live in a hard water area), and simmer the beans until just tender. The cooking time may be as little as 30 minutes, or over an hour, depending on the beans. 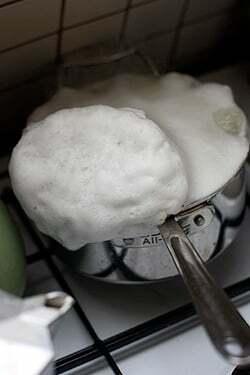 Add additional water if necessary. Once cooked, drain well and toss them in a bit of olive oil, which will prevent the skin of the beans from flaking, and bit of salt. 4. Next up is frying the beans: You’ll need to cook the beans in a single layer, so doing a rough calculation on depending on the size of your skillet, heat a portion of the butter and oil in the pan. Once hot, add enough beans so they’re spread out evenly in a single layer in the pan. Saute the beans and avoid stirring too much so they brown and blister on the bottom side. After a few minutes, stir them a bit to flip them around, and continue to cook a few more minutes until they’re all nicely seared. 5. 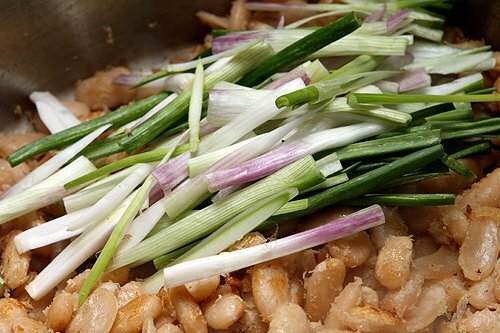 Once finished, transfer the beans to a bowl and fry the remaining beans in a similar fashion. 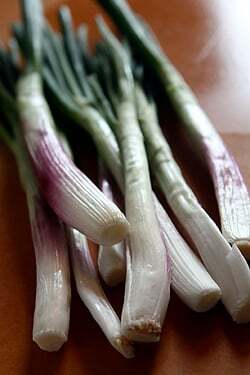 When you get to the last batch, during the final minute of cooking, add the spring onions, garlic, and sorrel. Cook until the greens are just wilted, which will take another minute or so. Remove from heat, add the other beans to the pan, stir, then add the 1/2 teaspoon of salt. Let cool to room temperature, or until slightly warm. 6. Once cooled, stir the lemon juice and sumac, and then roughly chop the fresh herbs and mix them into the beans. Crumble the feta over the top and serve. Storage: These beans are best served shortly after they’re made. If you store them in the refrigerator, they’ll lose their specialness. Note: I used clarified butter, but in retrospect, I think it’s better to use regular butter, salted or unsalted, which would help brown the white beans a darker color. *For those in Paris, two favorite places to shop for Arabic ingredients are Sabah (40, rue du Faubourg Saint Antoine), or Sepide (62 ter, rue des Enterpreneurs), which specializes in Persian ingredients. For those elsewhere, I’ve listed some sources below. What a beautiful blog you have! I was feeling for you re: the missed trip – bummer – and cracking up about the psychiatric evaluation, too funny! This inspires me to get a little more creative with my cooking, love all the different fresh ingredients and appreciate how you offer substitutions in case one can’t find…. I’ll be back to your blog for sure! Wonderful and funny post as always… Although I feel really sorry for you having to cancel your trip AND the dinner with Ottolenghi(! )… Nature can be cruel sometimes. Oh this sounds like heaven. 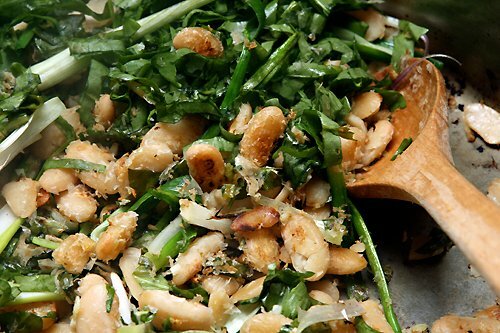 Reminds me of my favorite Italian-peasant cooking dish that my mom made when I was younger – Escarole & (White) Beans. But this will have a much more interesting flavor palette. Thanks so much for sharing! I happily have just enough sumac leftover from another project to make this happen. Where do you usually buy your “haricots Tarbais” (or other recommended whitebeans)? I love the idea of frying beans. Do you think it would work with smaller shapes, or is it only good with the broad, flat varieties? Also: Can I borrow some sumac? This looks utterly scrumdiddlyumptious. I’d happily trade in some of my chocolate stash for a bowl of that right now. And funnily enough, I’m in the opposite situation to you – I’ve had a jar of sumac in my cupboard for ages (probably too long), and never remember to use it. DL to the rescue again! I’m so intrigued by this book! Is is all vegetarian? I’m loving the sound of this recipe! I will have to go on a Western Canadian sumac search though….not sure where I can find it. Sini, I really recommend you do just that, my best friend sometimes works at the Almeida theatre which is just opposite the Islington branch of Ottolenghi, so when I see whatever play he’s working on I combine it with a trip to Ottolenghi (who I imagine get a lot of theatre-related business). I’ve never been disappointed by my visits and, great for me, so much of what they do is vegetarian. And delicious. We’ve also had many successes from the first cookbook. I am in a phase where every recipe I make calls for sumac. I also live in a place where trying to buy sumac is impossible. Grrrrrrrrrr. Clearly, I need to move. Lemme get back to you about the dough/oseille/money thing. Sounds like a fun little research project. I have been positively obsessed with frying beans ever since Heidi at 101cookbooks.com introduced it to me! Thanks for another recipe! Wow, this looks like a fantastic combination. I love that cookbook too. So sorry to hear about missing the dinner with him; that would be so disappointing! I’ve been making this dish since it was published in The Guardian a couple of years ago and it’s a real winner, so so good for packed lunch! Sometimes in the winter I replace the sorrel with fried leeks, I’ve added spinach before as well since I can’t always get hold of sorrel (and my attempt at growing it failed miserably!). Carly: I buy them either at Graineterie du Marché at the Marché d’Aligré (which I love) or G. Detou. But any broad white bean should do nicely. Kalyn: Thanks for the heads up on fattoush. I’ve never made it but now that I have the sumac, and your directions, I will! Olga: Most cities have an Arabic market somewhere, at least the ones I’ve lived in. Check out some of the links I give as well; you might be able to mail order it. It’s really and interesting flavor. Barbra: I think the broader the bean, the better for the surface to get blistered and browned. 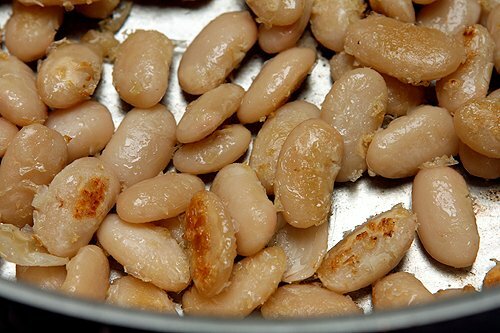 The picture of the pan fried beans is just perfect. I know we would love this dish. Thanks for sharing. Great dish with the beans. This dish looks so delicious and perfectly complete for a meal. I’ve had the browned beans, but only by accident..when the water evaporated from the boiling pan! It’s a lesson I seem to keep repeating about paying attention to the stove. I’ve caught it before it got to the scorched to black stage, (though I’ve done that by accident too) Never thought to just throw some butter into it to take it a little further and make it deliberate! I’m a HUGE fan of the first Ottolenghi cookbook, desserts and all, and yet have to ‘cook’ the book though I’ve made great headway. Along comes Plenty, and I love everything about it, including the fact that I have a sack of sumac, so no groveling! I love it when you say that you won’t miss meat … says ‘plenty’ about this moreish book which is already on my wish list! I’ll swap you Devonshire clotted cream for sumac. I’ve been following your blog for some time now, and I just happen to be in Paris (okay, Sartrouville). I’m staying with my aunt and her family, but none of them are interested in eating or drinking wine. As a chef from Portland, OR I’m kind of bummed out about this. I’ve been told all about these lengthy French meals that go on for hours (though hours aren’t a requirement) and do believe they exist, I just don’t know where to turn, and it’s not as much fun alone. Can you give me any suggestions on where to find people in Paris who might want to dine with a nice married (but traveling alone) girl from Oregon? I love food and sharing it with others. And I figure I’ve got nothing to lose in extending an invitation to you as well. I’ll be here through the 27th, and would be grateful for any help you may be able to offer. It is indeed a gorgeous book. Yummy …. my kind of dish! I had the same reaction when I got my copy of Plenty, I wanted to bookmark almost every recipe. I love this book and have already made so many things from it. I love how it inspires me too – I might not follow the exact recipe but Ottolenghi is inspiring me to do a lot of new things with veggies. I saw David’s tweet about needing a hand on where to eat out. I can always recommend the Baratin and Chez Michel, two standards. I also really like Pramil, located more centrally. If you’re stuck for something to do on Saturday night, I was going to pick a dinner date with two friends (bilingual) and you would be more than welcome to be our fourth, as long as we get some serious chef tips. We haven’t yet decided but I think one of those three should be on the list. Love this kind of dish and have a lonely little jar of sumac on the spice shelf that has been patiently waiting for a dish just like this one. I love sumac and am always looking for new ways to use it. Along with beans and sorrel (some of my other favorites) I think I have a new recipe to go on the idea board. Hi Claire, I found myself in a similar place last year in Paris…it was August and what helped me a lot was attending Le Cordon Bleu demonstrations to be able to meet people that shared interests with me. I looked for Ecole Lenôtre but it was closed for vacations so LCB was the option for me. Also, and you might think it as wild but helped was going to Disneyland Paris…it was a challenge to go on my own and I met really nice people, besides the food is delicious and there is wine available too. Get to those small books called Paris for you! Paris Gourmand, etc for free at those Paris Office de Tourism et des Congres. There is one on Champs Elysées, the information they contain is just great. Enjoy Paris! I also keep a nice little jar of sumac ready for any delicious recipe like this. These beans sound absolutely scrumptious. I wish I had a solution for poor Claire. What a let down to visit with relatives who had no interest if food or wine. Hello? Help Claire. Remember that food people know food people and they are respected here in France, just about everywhere, don’t be shy. Best thing to do is keep alert and then reach out to food people, for example stopping in the local boulangerie during a slow moment and asking, just saying you need, you need this, and chances are they’ll get it and make a call to someone they know who might be able to show you around a bit.. That’s the best way to get right to the heart of the matter. Can’t hurt to try. Good luck. Lucy (and Claire): When I’m traveling, if possible, I’ll go into a fish market and ask them where to eat. They usually only eat very fresh food (and they know freshness!) and I’ve not yet been steered wrong! Another way to meet folks would be to go solo to Chartier (7 rue du Faubourg Montmarte 75009, 01 47 70 86 29); the food is not really what you go for, but they have family-style seating so you could hook up with others at a table, and in any event it is quite an experience. I once met a woman on the train to Giverny and we got to chatting and enjoyed each other’s company, so we made a date to go out to dinner together later. It’s really not that hard to get acquainted with folks at tourist destinations. My budget was never really 4-star, but the kind of meal you are talking about I had once at the Ambassade d’Auvergne. Address and phone: Vous souhaitez recevoir les nouvelles des Petits Auvergnats ? this looks great! i’m eating vegetarian only this month (which is REALLY hard, and probably a stupid idea, but i do stupid stuff sometimes….) and cooking up a vegetarian feast at the end of may – this might be a great second course? I was in a similar situation of not knowing anyone and wanting to eat out when I first arrived in France for a two-year stay. As Karla stated, LCB classes are a great idea and so are guided walking tours. I did so many of these just to familiarize myself with Paris, but also met people along the way. These companies also do walking tours/guided tastings for food enthusiasts: Paris Walks, Context Tours, Meeting the French and O’ Chateau (wine tastings & food pairings). And as Lucy stated above, I go to the fish market, open market, butcher, etc. and ask others in the business where they eat. Rue Montogoreiul is a great place, David posted about here. A few places I would recommend, and have dined alone at each, are Mon Vieil Ami on Ile de St. Louis, Ze Kitchen Galerie in the 6th Of course, Mr. Lebovitz has many dining recs on this site, also. If Sini and others would like to have a DL Meetup at Ottolenghi for lunch in early June I’m game. Can we say “David sent us”? I’ve a feeling you could find sumac at the Sunday rue Montmartre marche or the marche Raspail, but now you’ve got a lifetime supply so not to worry. You might try http://www.meetin.org OR http://www.meetup.com; both have Paris groups and both are fun (at least, the ones in Portland, OR are)! Also, you could try eGullet.org and suggest an outing or perhaps join one. What a coincidence. I ordered Sumac this morning from Penzey’s (been craving Fattoush…) I’ll have to try this out too! I was wondering what i was going the do with the rest of the Sumac… Thanks! This is such a beautiful dish with some amazing flavors. I love sumac and recently did a green bean, tomato almond with sumac and loved it. Can’t wait to give this a try. Thank you for this. We’ve been growing more food in our tiny NOLA garden (30×30) and I’d planted red vein sorrel from an herb sale, just because it’s so beautiful; I’ve never cooked with it. This recipe appeals, and once I get the sumac I’m there. Love your writing, so down to earth, good to read and calming while we worry here. Thank you David. looks beautiful. do you think haloumi would work in place of the feta? i got giddy in a greek deli the other day and i now have more haloumi than is reasonable. I don’t think I have drooled so much over a dish since I discovered the Moro cookbooks. Cannot wait to make this. Where is his restaurant in Paris? David, I would think your spice guy on Rue de Montorgeuil would have sumac in manageable quantities (i.e., in bulk)… we visited him based on your recommendation a few weeks ago and was dazzled by the colorful bulk spices, dried fruit, and pulses. Lovely! I love sumac. Such a mysterious tasting spice. My grandmother used to do a similar thing with Georgia butter beans. Cook them, then a quick fry in olive oil, finished off with some cumin and sea salt. Delicious. I recently received Ottolenghi’s first book- ‘The Cookbook” for a gift and I simply fell in love with the recipes, the reading and just the whole style. Looking forward to trying this recipe from the new book. BTW, I adore “The Perfect Scoop” and have made a committment to trying each and every recipe in the book- no matter how long it takes me! what a delicious, healthy and hearty looking meal! Violet: Yes, it is a mysterious sour-citrus note; that’s pretty right-on about its flavor. It’s normal to ‘adapt’ recipes when presenting them because I made some changes to it and because of rights issues: one can’t (and shouldn’t) simply reprint copyrighted material. I wrote an article about Recipe Attribution, which explains how to re-write and attribute recipes. Yael: Glad you like both of our books. Happy churning! Nisrine: We were trying to decide if it was, indeed, Arabic, North African, or Provençal. I’m amazed because I never seen sumac in any of the arabic and oriental shops I know, in my *province*. I must admit I don’t even know what is the taste of it (maybe I’ve tasted it in something else without knowing it was sumac, at least). Several days ago, I would have bet all my money that sumac was very difficult to find in france :D. Not that… See More I had so much money to lose but I’m glad I did not make that bet :D ! I still wonder what is the taste of this spice. could someone tell me if there is some classic middle east or arabic dish especially featuring the taste of sumac, that I could have encountered in restaurants ? I am completely obsessed with Ottolenghi, it’s become my favourite spot in London. The man creates magic with salads and vegetables. To have dinner WITH Ottolenghi himself – well, that’s pretty awesome. I hope you still get to have your dinner one day! I am a HUGE fan of the first Ottolenghi cookbook. 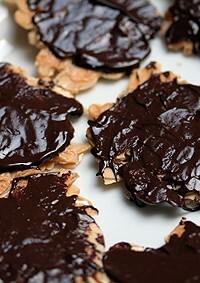 You remind me to make those florentines..I’m sure you’ll see them on my blog pretty soon ! I beg of you, please PLEASE try to recreate your mum’s Lima beans. My mouth was watering over your description of them. They sounded absolutely delicious and I am one of those odd people that adore Lima beans. Actually, any kind of bean is a friend of mine! The way you described those crisp yet creamy beans sent me to the fry pan with a bunch yesterday, and some clean beef fat. Sadly, while they were good, they felt heavy and perhaps greasy and didn’t have the texture you described. I do think roasting them like your mum did might be the way to go. 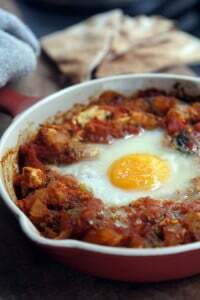 Any chance of you trying that recipe out for your loving readers? yotam ottolenghi does not give correct recipes in his books, especially the recipes for baked goods and cakes where exact amounts are crucial. 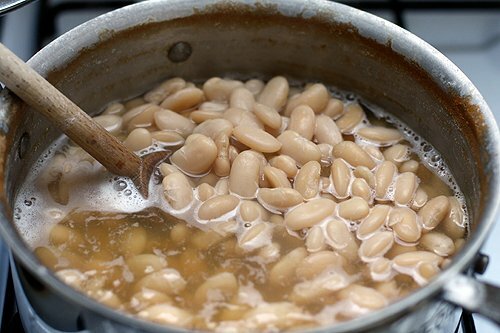 even in this recipe of the beans, if you soak one pound of beans with 2 tablespoons of baking soda, you would get a mush , not beans fit for frying. Wonderful use of sorrel, but, I’m curious–how did you manage to wilt the sorrel without its becoming an unappetizing army-green color? That is a nice heaping bowl of beans. This inspires me. 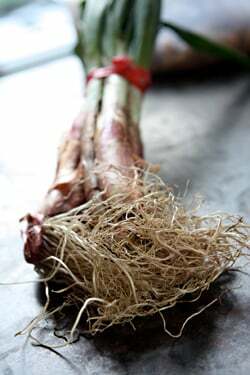 I think I might like to try this using fava (fried up in some extra virgin with garlic, shallot, and crushed red pepper), the last of the spring onions from the garden, and shavings of romano. A nice side for rabbit or goat. That sounds amazingly good. No sorrel in Rome, alas (despite that there is an Italian name for the stuff) so thanks a lot for offering substitution. I feel your sumac pain. We sprinkle it on chicken kabobs and when I ran out a few years ago, I discovered that Trader Joe’s no longer carried it and could not find it anywhere. Luckily, Penzey’s opened a store nearby. Seems I NEED to have another cookbook because this recipe sounds delicious. p.s. made your chocolate chip cookies today. Damn, they are good. Gorgeous photos of gorgeous food!! I adore Ottolenghi’s first book, too, and will be after the new one. Sadly, a trip to actually eat his food is not likely in the near future – the tyranny of distance and all that! Sam, if the invite is still open I’d love to join in. Let me know & we can exchange info. Everyone, thanks for all of the great tips, they are much appreciated. And thanks to you, David, for getting the word out. Thanks for all the delicious recipes! I tried this last night but had to use canned beans… and although the flavor was great, most of the beans ended up looking like some kind of hash and became mush. What did I do wrong? I do not want to infringe on any copyright, therefore no quotes, but trust me, Katzer’s site is well worth visiting and reading. @Tamsin email me on my blog, since you don’t have a link. The main resto is in Islington, but there are 3 take-out places of Ottolenghi ( I so want to call him Olatunji). Some have communal tables. All the menus are to die for!! I plan to eat there as many times as possible during my10 days in London. David let me know if you want me to bring you some Take-out on the 13th. You are without a doubt one of the wittiest writers in Blogland! I haven’t had so much fun reading about real life in France since A Year In Provence. And your recipes of course are always amazing. Thanks for posting this. Perfect timing for this recipe for me, as my backyard sorrel plants are getting big and it’s not quite the season for making potato-sorrel soup. I’m out of sumac but it’s not too hard to find. For S.F. Bay Area readers, another excellent source of beans is Phipps Ranch in Pescadero (San Mateo County, close to the ocean). They grow a few varieties on site, sell others grown elsewhere, so be sure to look at the signs carefully if you want the “estate beans.” And in a few weeks the farmers markets will be having fresh shelling beans that might work great for a recipe like this. Last month I made a lovely recipe that called for pan-fried beans. It was a chickpea salad with leeks and curried yogurt dressing from 101cookbooks blog. So, for those of you intrigued by pan-frying beans, try chickpeas! The texture is extra-interesting because the nubbly, round surface fries irregularly. Sumac is delicious sprinkled on melon and allowed to be absorbed for a few minutes. Further to this wonderful recipe I ordered Plenty and it just arrived. It is FABULOUS! I really enjoyed the flavor of these – but found them a bit dry – any suggestions?